They KNOW They Can Dance! Axis Dance Company. Joel Brown and Sebastian Grubb. 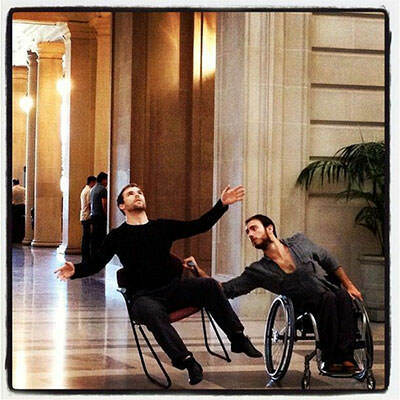 AXIS Dance Company, based in Oakland, California, creates, performs, and teaches “physically integrated dance”—a contemporary dance form that evolves from the collaboration between dancers with and without disabilities. In existence for 25 years, we have many accolades under our dance belt, so to speak, however, it was our recent appearance on Fox TV’s So You Think You Can Dance (SYTYCD), where we reached one of their biggest milestones—dancing before the largest mainstream audience yet. With this appearance, our Facebook page was flooded with comments, Tweets poured in, and our website received 5,700 hits in one day, not to mention being selected as TV GUIDE'S Most Inspiring Dance Moment of the week. This was the second year in a row that AXIS was invited as guest artists and while it was indeed a testimony to the high artistic standards and accomplishments of the company, it was also a nod to what AXIS has always stood for: Dance is for ALL people of ALL abilities. For me and the company's other remaining co-founder, Artistic Director Judith Smith, AXIS's appearance on SYTYCD was particularly thrilling. We have watched the company grow from a naïve exploration into how people with differently abled bodies could dance together, to one of the world’s most innovative ensembles of performers with and without disabilities, thanks in no small part to Smith's tireless work and creative vision. The two of us both remember a time not so long ago when some dance critics refused to review the company's performances because they believed that AXIS was not a "real" dance company, but rather some kind of recreational therapy group. One-time dancer with AXIS, Tom Metz, eloquently responded to the assertion that AXIS wasn't a "real" dance company with these thoughts: "Was it because some of the dancers can't dance in toe shoes? That's like saying Janis Joplin wasn't a real singer because she couldn't hit a high C, or Luciano Pavarotti and Irving Berlin were not real musicians because they couldn't read music (really, they couldn't). What defines an artist is each artistic choice he or she makes within their medium. For a dancer, the medium is the dancer's physical movement, and the aesthetic choices he or she makes about that movement. A dance is comprised of a thousand artistic choices about how to move through the performance space, at what tempo, and how the dance unfolds over time. For some AXIS dancers, the range of gesture and movement may be restricted, a reality for any dancer, with any dance company. These limits define what it means to be human. AXIS strikes an especially thrilling chord with audience members who see a reflection of their own range of limited gesture and motion. But AXIS reminds us that within every restriction and every limitation, the number of possible artistic choices is limitless. And the most stirring art occurs when a human being strains against those limits. Now in its third decade, AXIS’ vision is to remain a leader in the growing field of physically integrated dance by continuing to set new artistic and educational standards. Likewise, it aims to be a contender in the field of contemporary dance by commissioning renowned choreographers, composers and designers to create an exciting, innovative touring repertory. AXIS wants its work to challenge traditional definitions of ‘dance’, ‘dancer’ and ‘ability’ to expand dance to include an entire community that has been virtually left out of the performing arts. Wouldn't it be something if the next time AXIS appears on SYTYCD, it is to have one of our dancers compete on the show—not just as a guest performer? 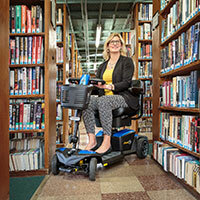 AXIS will give a short performance and workshop at the Abilities Expo in San Jose on Friday, November 16th. To see more of our work and learn more about the company, visit http://www.axisdance.org.